CarGurus has 24,357 nationwide Durango listings starting at $1,900. Structurally, the 2014 Dodge Durango feels like it has been carved from a single block of steel—rugged, durable and impervious to bumps, cracks, holes and indifferently maintained roads. When most people think of a Dodge Durango, they picture a big, lumbering, old-school SUV that looks like an antique truck from the 1950s or '60s. They aren’t thinking about the current version of the Durango, a stylish, safe, roomy, refined and technologically sophisticated SUV that would easily sell in greater numbers if people would just go to the dealership and take a test drive. There is one major hurdle for consumers, though, and that is unfavorable reliability and cost-of-ownership predictions from leading auto industry research firms. Dodge has work to do in this regard. Ever wish that Jeep built a 7-passenger version of the Grand Cherokee? Surely, you aren’t alone. Let me tell you guys a little secret: The 2014 Dodge Durango is built on the same platform as the Grand Cherokee. Therefore, it is, literally by extension, exactly what you’ve always wanted. Except for the lifestyle and prestige associated with the Jeep badge, of course. Or a Jeep’s unstoppable off-road capability. The Durango looks much different from a Grand Cherokee, too. It’s hunkered down closer to the ground and sits on a wheelbase stretched by 5 inches. Add Dodge design cues like a big crosshair grille and enormous “ring of fire” taillights that remind me of a 1980s pop-music classic by Corey Hart (arrrgh, it’s stuck in my head again! 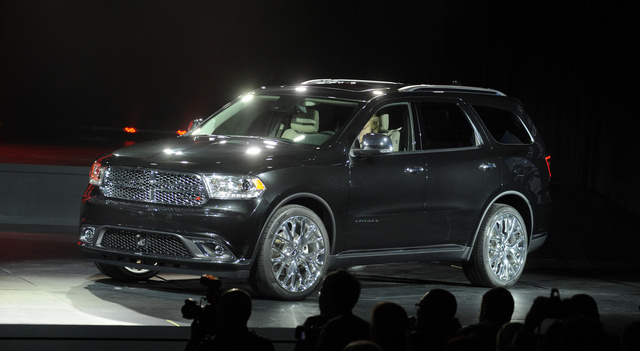 ), and the longer, sleeker Durango exhibits a personality all its own. Depending on the version you choose, a 2014 Durango is sensible, no-nonsense family transport; a Hemi-powered SUV emphasizing the sport portion of the equation; or a luxury-lined rig perfect for road trips. Prices start at $30,790 for the base Durango SXT, including the destination charge of $995. If you want any options, you’ve gotta spend another $1,700 and start off with the Durango SXT Plus, which includes a 12-way power driver’s seat, a leather-wrapped steering wheel, roof-rail crossbars and satellite radio. This version of the Durango can be upgraded with a long list of extras. One thing missing from the options list, though, is a V8 engine. For that, you need to buy the Durango Limited ($36,990) and add the more powerful V8 engine as an option. Standard equipment for this model includes leather seats, heated front seats, heated rear seats, a 6-way power front passenger seat and memory for the driver’s settings. The Limited also includes a heated steering wheel, an 8.4-inch color touchscreen infotainment system with Uconnect Access services, dual remote USB charging ports, a 115-volt power outlet, an upgraded sound system and remote engine start. Polished aluminum wheels and LED running lights identify the Durango Limited from the outside, and this version of the SUV also features a reversing camera, rear parking-assist sensors, a universal garage door opener and more. The sportiest version of the 2014 Durango wears an R/T badge and liberates $39,990 from your wallet. It comes standard with a 5.7-liter V8 engine, a 3.09 rear axle ratio, a dual exhaust system, performance steering, a sport-tuned suspension, heavy-duty brakes and 20-inch Hyper Black wheels. Additional changes include black headlamp bezels and body-color exterior trim, and the Durango R/T is equipped with a standard premium sound system and a power tailgate. At the top of the Durango lineup sits the Citadel ($41,990). It expands upon Durango Limited equipment with premium leather upholstery applied to the seats, the power tilt/telescopic steering wheel, the center armrest and the door panels. Additionally, the Citadel is equipped with an 8-way power front passenger’s seat, ventilated front seats, a power sunroof, a navigation system, a cargo net and a cargo cover. The Citadel sits on 20-inch polished aluminum wheels, and it features standard bi-Xenon headlights, rain-sensing wipers, heavy-duty brakes, a unique grille and lots of extra chrome trim. My Durango Citadel test vehicle included the standard V6 engine and the available all-wheel-drive system ($3,400). Painted in Maximum Steel Metallic with a Black/Light Frost leather interior, my SUV had second-row captain’s chairs ($895) separated by a second-row center console with an armrest and storage ($300), a rear seat entertainment system ($1,995) and a Technology Group ($1,995: Adaptive Cruise Control, Advanced Brake Assist, Blind-Spot and Cross-Path Detection, Forward-Collision Warning with Crash Mitigation). The sticker price came to $48,575. Normally, whenever I drive a mainstream SUV wearing a price tag like that, my wife says: “I could get an Audi Q7 for that kind of money.” The girl does love her some Audis. This time around, though, the Q7 didn’t come up. That’s because, in Citadel trim, the 2014 Dodge Durango easily convinces as worthy of the asking price. First, the Durango is a good-looking vehicle, except for its goofy new taillights. Second, no matter what part of the cabin you poke or prod, nothing about the Durango’s materials makes you think a cost-crazed Chrysler accountant went through the SUV’s cabin with a red pen. Well, except for the fake burled walnut wood trim. That’s pretty awful. Designers paid close attention to what they were doing, too. Choose the Light Frost or Tan interior color, and Dodge leaves the upper portions of the dashboard and door panels black in order to reduce glare while at the same time giving the SUV an upscale appearance. Black carpeting, floor mats and doorsill trim hides scuffs and dirt, and after a rainy week of family shuttling duties, the Durango was remarkably easy to clean up. I do have one note of caution, though. With fewer than 775 miles on my test Durango’s odometer, the Light Frost leather on the driver’s seat already showed signs of dye transfer from dark-rinse jeans. Consider yourself warned. Equipped with a 3.6-liter V6 engine making 290 horsepower and 260 lb-ft of torque, my Durango’s power plant was down 70 hp and 130 lb-ft of torque compared to the optional 5.7-liter V8 engine. Installed in a vehicle tipping the scales at more than 2.5 tons, the zesty V6 capably acquitted itself, revving freely and smoothly, showing no signs of trouble merging onto fast-flowing freeways or passing slower traffic with my family aboard. 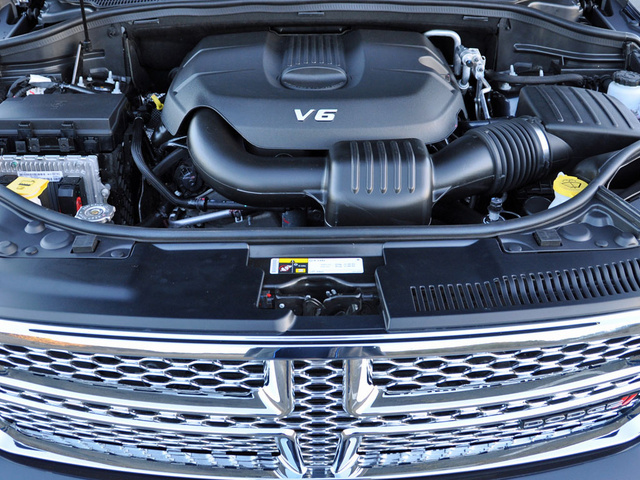 Credit for the V6 engine’s unexpected performance is due, in part, to the Durango’s 8-speed automatic transmission. Equipped with a novel rotary shift knob on the center console and a set of paddle shifters mounted to the steering wheel, the automatic does an excellent job of making the most of any driving situation. With the Eco driving mode activated, the transmission upshifts rapidly in order to keep engine revs low and to conserve fuel. Jab your right foot down on the gas pedal, though, and the Durango’s demeanor changes in an instant. The transmission can also detect when the SUV is being driven uphill, downhill, or in a spirited fashion, shifting and holding gears accordingly. The majority of my miles were covered with the Eco mode engaged, and I averaged 18.2 mpg. That’s less than the 19-mpg rating the EPA says my AWD test vehicle should have achieved, but it's better than what I’ve seen from a 2014 Chevrolet Traverse and a 2014 Ford Explorer. Plus, a Durango tows more weight than either of those models, at 6,200 pounds. Get the optional V8 engine, and the tow rating jumps to 7,400 pounds. In addition to offering a couple of capable powertrains, the 2014 Durango is a genuine pleasure to drive, offering a remarkably quiet and serene cabin. It is very easy to hold a conversation when driving 75 mph down the highway, as there is virtually no engine or tire noise intruding upon the cabin at cruising speed, and just a hint of wind noise makes itself evident. Better yet, the Durango’s 4-wheel independent suspension pounds crappy pavement into submission and manages the SUV’s weight in admirable fashion. Structurally, the Durango feels like it has been carved from a single block of steel—rugged, durable and impervious to bumps, cracks, holes and indifferently maintained roads. My Durango Citadel included heavy-duty 4-wheel ventilated-disc brakes, and they were outstanding in terms of pedal feel, modulation and response, no matter the type of driving. The electric steering felt just right when bombing down the freeway or wheeling around town. On curves and highway off-ramps, though, the Durango felt a little darty for such a large, heavy and tall vehicle. As far as I’m concerned, though, this represents the Durango’s single dynamic flaw. Yes, in the absence of the snow that has pummeled the country during the winter of 2014, I put the Durango into some dirt. It was even wet, because it finally had rained in Southern California. Accelerating up the twisty road that leads to my top-secret Malibu off-roading spot, the 20-inch tires gripped well, and they dispatched mud puddles with equal ease. However, while the Durango is based on the same underpinnings as a Grand Cherokee, it cannot boast the same degree of suspension articulation, approach angle, breakover angle and departure angle, limiting its capability in the really rough stuff. Plus, it’s got 8.1 inches of ground clearance, which is a half-inch less than a Subaru Outback. As I mentioned in the Look and Feel segment, the Durango Citadel’s interior looks great, and Dodge refrains from using overtly cheap materials anywhere in the cabin, even for the third-row seating and the cargo areas, which is where lots of corporate bean counters tend to get their way. As a result, a Durango Citadel is inviting from the moment you open one of the doors, and especially when decked out in Black/Light Frost or Black/Tan color combinations. Once you’ve parked yourself in the driver’s seat or the front passenger’s seat, the Durango proves comfortable, too. The heated seats and heated steering wheel do a great job of taking the chill out of a rainy and windy day, and when temperatures rebound into the 80s after the storm has passed, both front-seat occupants can appreciate the Citadel’s seat ventilation system. While the Durango’s rotary transmission control takes some getting used to, this SUV provides easy access to USB and SD card ports, and they are illuminated at night to make them really easy to find in the dark. Also, I especially liked the soft, wide upper door panels, because that’s where I tend to crook my elbow while slogging down the freeway. 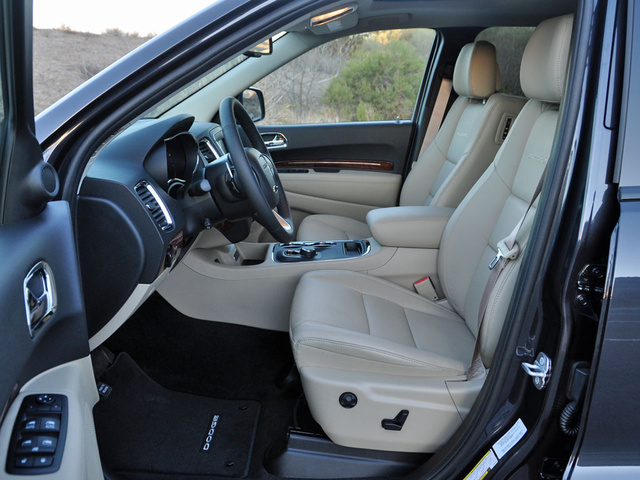 The Durango’s second-row captain’s chairs are not as comfortable for adults. They recline, and in several models they’re heated, but they don’t slide fore-and-aft, and they sit too close to the floor to provide decent thigh support. As a result, I slouched and sat splay-legged in them, and my shins also kept banging into the hard plastic front seatback trim. Ouch. Here’s another problem related to second-row seats that don’t slide: The Durango’s rear doors are long, and they open wide, but with the second-row seats mounted so far forward in relationship to them, exiting the Durango in cramped parking quarters is really difficult, especially for less limber people. In my experience, the Durango’s third-row seat is actually more comfortable. It sits higher off the floor with better thigh support, provides just enough legroom for people 6 feet tall, and with the second-row seat backs folded down, occupants can stretch their legs like they’re in their own living room. Third-row occupants can also access the second-row center console, providing them with USB charging ports and a roomy storage bin. 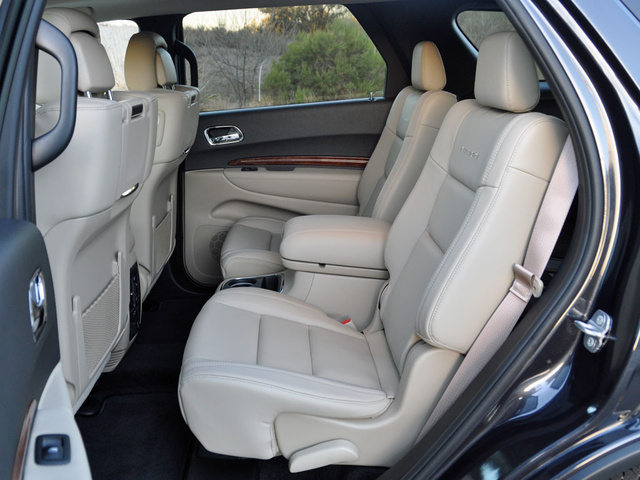 Regardless of the seating positions that rear passengers choose, a Durango with the optional rear-seat entertainment system and Blu-Ray DVD player is a gamers’ delight thanks to dual viewing screens, dual wireless headphones and dual HDMI and audio/visual jacks along the inner edges of each front seatback. Dodge also provides a single 115-volt power outlet and dual USB charging ports for the rear-seat occupants. A Durango holds plenty of people or plenty of gear. If you’ve got a full load of passengers, you must settle for 17.2 cubic feet of cargo space behind the third-row seat. While that is measured to the roof, it should be noted that the amount of floor space back there is fairly generous and that a storage well is located underneath the cargo floor. 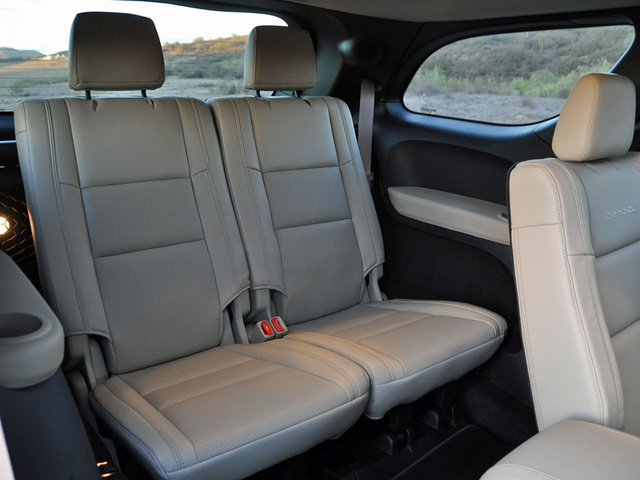 If you can fold the third-row seat down, the Durango carries a 47.7 cubic feet of your stuff. Fold the second-row seats down, and this SUV swallows 84.5 cu-ft of cargo. Got something longer to haul? All Durango trims except the Citadel include a fold-flat front passenger’s seat. If this isn’t enough, the Durango features numerous storage cubbies, most of them lined with rubber to quell noise, vibration and harshness. Thoughtful touches abound, such as plastic grocery-sack hooks on the front seatbacks, the easy-to-reach button for closing the power tailgate and a removable flashlight that's integrated into the wall of the cargo area. If not for the comfort and packaging of the second-row seats, the Durango would rate higher in terms of Form and Function. A Keyless Enter ‘N Go passive entry system with push-button start is standard for all Durango trims, and my Citadel test vehicle included a 7-inch configurable center instrumentation display and a 9-speaker, 506-watt premium audio system in addition to the rear-seat entertainment system described above. It also had Dodge’s Uconnect 8.4 touchscreen infotainment system and Uconnect Access services. In my opinion, Uconnect 8.4 is the best infotainment system on the market today. With an 8.4-inch screen, large and responsive touch-sensitive buttons, crisp graphics and a sensible layout, it should serve as a model of usability for the entire industry. I find it very easy to pair my smartphone using Bluetooth, to stream music and to make and receive calls. Uconnect Access service is available on any Durango and included with the top-of-the-line Citadel. The subscription-based feature comes with 6 months of free access, and then owners must pay a fee to continue service. With Uconnect Access, the Durango provides real-time traffic and weather reports as well as the ability to find nearby gas stations and compare prices, and it delivers access to movie listings and sports scores. It can even transform the Durango into a mobile Wi-Fi hotspot, and by pressing a “911” button on the rear-view mirror, the owner can summon help in an emergency. Additional technologies related to safety systems are discussed in the next section. 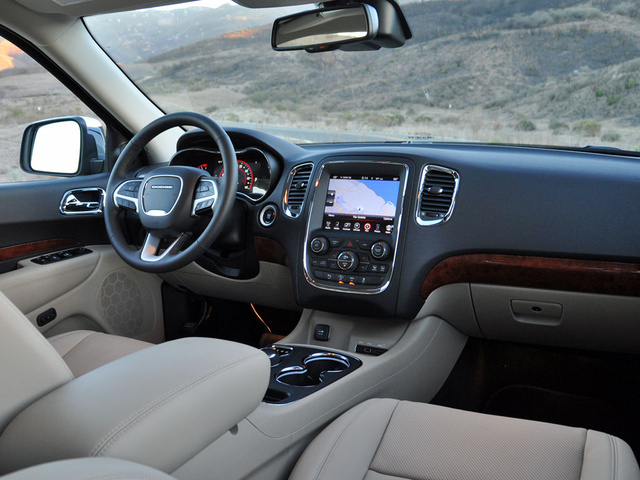 Uconnect Access and its “911” button represent one of several safety features offered on the 2014 Dodge Durango. The SUV’s braking system includes Ready Alert Braking and Rain Brake Support functions, and the Durango SXT Plus can be optioned with the reversing camera and rear parking-assist sensors that come standard on the Limited, R/T and Citadel. Additionally, the Limited can be upgraded with rain-sensing wipers, automatic high-beam headlights and a Blind-Spot Monitoring system with Rear Cross-Path Detection. That last feature is also available for the R/T and the Citadel, packaged with an Adaptive Cruise Control system, and a Forward-Collision Warning system with Crash Mitigation technology. Trailer Sway Control is standard for all 2014 Durango models. In crash tests performed by the National Highway Traffic Safety Administration (NHTSA), the 2014 Durango receives an overall rating of 4 stars. Review individual test results, and the only 4-star ratings are for frontal-impact driver protection and the SUV’s ability to resist rollover. In all other assessments, the Durango earns 5-star ratings. Test results from the Insurance Institute for Highway Safety (IIHS) reflect the top rating of Good in all measures except for the small-overlap frontal-impact test, for which the Durango had not been assessed as this review was written. Models equipped with the optional Forward-Collision Warning system also receive a Basic front crash prevention rating from the IIHS. Every time my wife and I drive a modern Dodge Durango, we’re genuinely impressed by its refinement, driving dynamics, utility, thoughtful design and advanced technology. This is a vehicle that would go on our own short list if we were shopping for a new SUV. But then I investigate a Durango’s likelihood of serving our family as reliably as our aging Nissan Murano has, and I second-guess the wisdom of my enthusiasm for the Dodge. The problem isn’t the fuel economy. I missed the EPA’s combined-driving estimate of 19 mpg by just 0.8 mpg. And as I stated previously, the Durango got better mileage than a 2014 Chevy Traverse and a 2014 Ford Explorer while in my care. I also don’t care that much about ALG’s 2-star rating for the Durango’s ability to hold its value over time. What concerns me is reliability and the costs associated with owning a Durango. According to Consumer Reports and J.D. Power, a Dodge Durango is expected to deliver below-average reliability, and Consumer Reports also predicts high ownership costs. Knowing that a Durango doesn’t command sticker price helps take the edge off those predictions. Since TrueCar estimates a 12% discount off the sticker price, the thousands saved can be put into an extended warranty plan or set aside just in case something goes wrong with the Durango after the factory warranty expires. Alternately, I could just lease a Durango and make the SUV Dodge’s problem when it starts to get old. But due to its inability to hold its value over time, Durango lease payments are not terribly competitive. 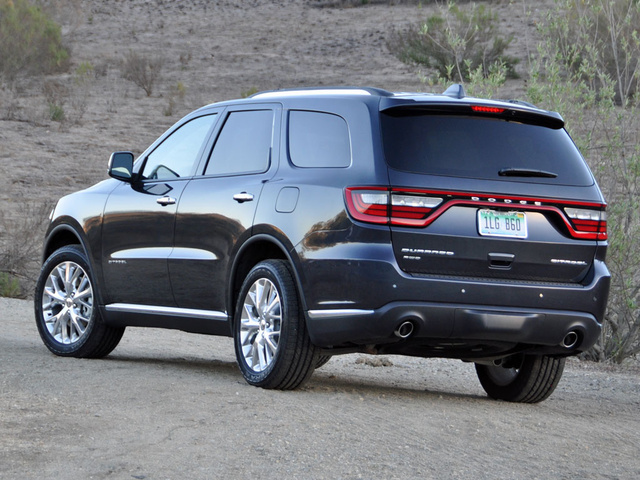 What's your take on the 2014 Dodge Durango? mkstn Just hope the reliability predictions do not hold true. As for everything else I really like the Citadel comfort and tech. Got 25+ mpg on my drive home from the dealership. I traded my 2012 Jeep Grand Cherokee so that we had more room when traveling. nightrph Even though, historically, Consumer Reports rated past reliability poorly, they have this current Durango as one of their highest rated SUV's and have it on their "Recommended" list. 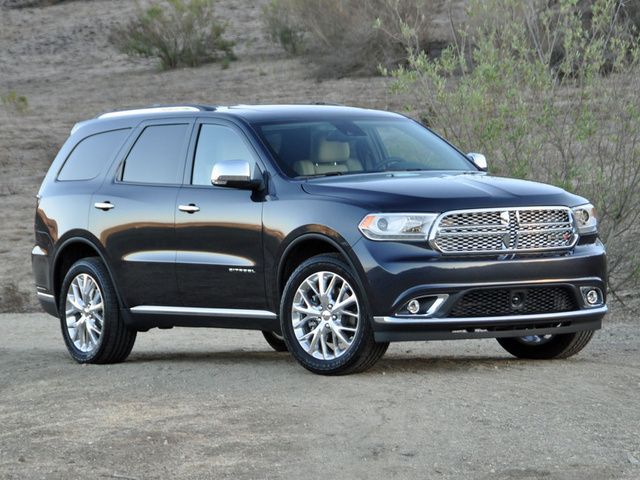 Users ranked 2014 Dodge Durango against other cars which they drove/owned. Each ranking was based on 9 categories. Here is the summary of top rankings. Have you driven a 2014 Dodge Durango? I have a 2014 dodge durango. From the driver door master switch the back windows work but nothing does. I have already replaced the master switch didn't fix anything. whats the rotor size front and back on durango 2014 limited! ?